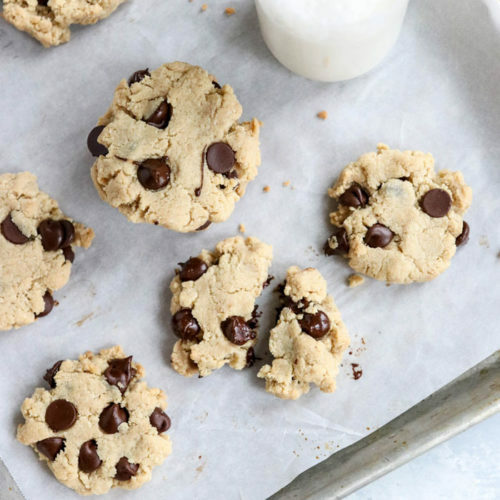 These Paleo Chocolate Chip Cookies are naturally gluten-free and egg-free, made with almond flour, coconut oil, and maple syrup. They remind me of shortbread, with chocolate chips! Preheat the oven to 350F and line a baking sheet with parchment paper to prevent sticking. In a medium bowl, whisk together the almond flour, salt, and baking soda. Add in the melted coconut oil, maple syrup and vanilla extract and stir again. Fold in the chocolate chips, then drop batter by rounded tablespoons onto the prepared baking sheet. Use your fingers to flatten and shape the cookies to your liking-- they will NOT spread when baked, so make them the shape you want. Bake at 350F for 8-9 minutes, until the edges are lightly golden. The darker they get, the crispier they will be.